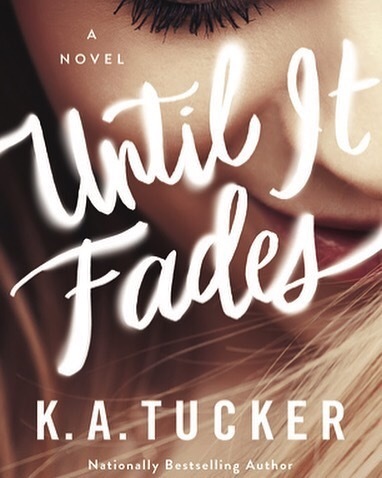 ABOUT UNTIL IT FADES:Twenty-four-year-old truck stop waitress and single mother Catherine Wright has simple goals: to give her five-year-old daughter a happy life and to never again be the talk of the town in Balsam, Pennsylvania (population three thousand outside of tourist season). Ka Tucker smashes it out of the park yet again! This time however she does it in a very different way. The thing I love about Tucker is her story telling ability, the fact that she is the queen of romantic suspense yet she has just written one of my new favourite easy reads shows how talented she is. The thing I love most about until it fades is it’s simplicity. The story has no major dramas, it has amazing characters that you can’t help but fall in love with and actually feel as if they’re friends. You genuinely root for them throughout. The character development for me is what keeps me coming back to Tucker, she creates these people we fall in love with or want to hate. You can’t help but feel like you’re apart of their world. She doesn’t just stop at the main characters it breeds into all of those. I even feel like she could write a full book for any of the side characters and I’d happily pick them up. Catherine is a fabulous heroine, the kind of girl we wish we could be if put in her situation. She’s smart, unassuming and a real sweetheart. You can’t help but be endeared by her from the get go. As for Brett *swoooooon* he’s everything a book boyfriend should be and that is all I’m saying about him. This book is pure romantic indulgence, it’s well written, it’s all consuming and you will easily read in one sitting. If you want light hearted fun, this is it. Another fantastic read from KA Tucker. Romance junkies, what are you waiting for?